On Saturday afternoon my cousin Erin married Chris - a part of the family all but officially for a few years now - on the balcony of the Melbourne Town Hall. The ceremony was smiles, tears and laughter, and included a kazoo. Simple and full of personal significance. Their vows to each other were lovely and may have bought a tear to my eye. After mingling and photos on the balcony, we all walked with the bride and groom up Collins Street to their reception venue, Hare and Grace. The bride and groom's parents gave a speech after the first course, the wedding party after the second. Chris and Erin had a sweet dance number then others were invited to join them on the floor. Love this sneaky photo of my Mum and Dad. It was my aunty Lyn who asked my sister and I to dance, then soon it seemed the whole family was up on the floor. None of us known for our dancing abilities, it was so much fun. So many laughs. Facebook post, 10:42pm: Just danced to La Bamba with Mike. Got to love a wedding! - at Hare and Grace. Then all too soon we were saying goodbye to the bride and groom and heading home. A really wonderful evening. A favourite night. Congratulations Chris and Erin! And thank you. Taken outside the Melbourne Town Hall before my cousin's wedding. It has been a pretty crazy week. We've had dinner with Boyf's parents, dinner with my parents celebrating Dad's birthday, visited Boyf's grandparents, my last pottery class, Friday night drinks with friends at the place with the great tacos, inspection of a house we thought we liked, my cousin's wedding and yesterday morning I dropped Boyf off at the airport as he headed off to Singapore. I came home and took a nap. Have a play date with my favourite eight year old. Get back climbing - I've been dealing with a pesky shoulder and haven't climbed in a few weeks, incredibly frustrating given how close I was to finishing the elusive Grade 16 climb. Finally, fingers crossed, I'm not 'broken' anymore, as climbing friend Ben puts it. Write some blog posts that I've been meaning to get to - I haven't officially ticked Vegetarian Week off my 30 While 30 goals and that happened back in May! Finish my Week in the Life 2012 photobook. Order some photos - including car photos for Boyf to go in frames in the living room, which I talked about doing before I even moved in! Tick off more 30 While 30 goals - such as plant a rosebush, go to the museum or gallery and have a group picnic. Have a long weekend in Singapore - Boyf mentioned our plans to some others going on course and was asked 'But what will she do while you're in class?' Boyf tells that he struggled to grasp the question, 'She'll do whatever she wants and probably be more capable getting about than I am.' So love his confidence in me. Work on my Scrapbook on the Road Version 2 minibook. Vote in the Federal Election. Finish my 'I Am...' layout - started last October. Buy a hair straightener - because I love the curls my hairdresser gave me for the wedding. Have some girl time with my sister. Attend football finals - Carn the Catters! And finally, lots of Skype conversations. I've been to Singapore four times now, and yet have never managed to leave the airport. As far as airports go, it is a pretty interesting one; these photos were all taken there. Journaling reads: My home for almost five months now, Red House does feel like home. I love the D hanging up in our bedroom and seeing the new polka-dot cushion across the room as I head out the front door. Poppa's buffet units seem purpose-built for just that spot and Mike has commented that the house had never looked this good. Grandma Esme mentioned recently she'd wondered about Mike and I being so different, then she'd seen something weird pretty and something weird odd sitting next to each other on the bookcase and thought that was us exactly and we'd be fine. With an adventure room and scrap room, this house is now a mix of us both. I love sitting across the desks from Mike as I scrapbook, chatting as he works on his own task. Or being able to look across the CDA - short for 'cider drinking area' as he calls it - and seem him working in the shed. I'm not so fond of the frog painting covering the uglier air conditioner, or the front room so often being filled with clotheshorses we've nicknames it the 'Chinese laundry'. There is a kitchen table used only for dumping things, floors forever in need of sweeping and a list of home improvement tasks that'll never be finished. But I walk in the front door and see my huge framed photo, little pot plant, dish for my keys and I'm happy. Home. I'm really liking how this layout turned out. The journaling is a wonderfully odd mix of my thoughts about this house that I'm so glad to have recorded. With a very text and photo heavy layout, I've kept the embellishments to a minimum and managed to slip some white space in there. The script title and scalloped edge to the photos work to add some curves to a very linear layout. And no, I don't live at 6 Scraple Crt. ;) I have my actual address cut out the same, ready to add now that I've taken some photos to share. Journaling reads: When I first started scrapbooking my trip to Europe back in 2004, I couldn't have imagined the impact it would have on my life. 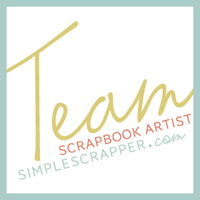 Scrapbooking, photography, blogging - documenting is a huge part of who I am. I enjoy it, but more importantly I'm a better, happier person. I notice more, appreciate more, love more - because I document & reflect. Loving the little moments, '13. 5. Make a pizza from scratch. The dough rose nicely. The pizza sauce was lovely and garlicy. Tomato, bacon, spinach and egg. As I said to Boyf many times during dinner, we rocked the pizza making! Delicious. Now I know how simple it is, I'll definitely be making homemade pizzas bases again. As I was sanding back the bookcase the other weekend, I realised that I've used more power tools in the last year than I had in all the years previous combined. That random thought and the concept of directional storytelling from Ali Edward's Hello Story class resulted in this layout. Boyf and I each wrote a list of things that seem different about our life now. The idea of adding the journaling to an arrow shape came easy, but I there was a lot of ummed and ahhed about the finishing details. HE Has an extensive knowledge of scrapbooking items and celebrity scrapbookers – more than any straight male should know. Has been introduced to good restaurants; introduced to another way of spending large amounts of money. Has throw cushions and interior plants. Knows there will always be photos taken, no matter what the occasion; the familiar sound of the shutter. Feels odd traveling without her, turning to point things out. SHE Uses power tools and has specific clothes to wear in the shed. Doesn’t have to pay or remember to get her car serviced. Groans at many bad jokes. Has become a cider connoisseur. Gives and receives a lot of hugs. Has weekends that are busier, fuller. Feels that so much more is possible, supported in her goals and plans. Has learnt about cars, planes and motorbikes. Frequently eats beans and mushrooms. Has a boat licence and has driven a four-wheel drive. Supplies include: red glitter thickers (currently 50% off), journaling pad and chipboard embellishments. 30 While 30: Cutler & Co.
3 and a half hours. 4 courses with matched wines, and a glass of sparkling to begin. Absolutely delicious. Absolutely full. Absolutely expensive. Absolutely worth it. 30 While 30 goal, number 19 - Eat at an amazing, new to me, restaurant. Ticked. This is the card that almost didn't happen. My sewing machine managed to put a large oil splodge on the first version. The second version turned into a hot mess after I didn't pick up the inside pocket on the first sewing go-round and tried a few extra stitched loops. By this time my stress levels were raised - did I mention it was after 10pm the night before a post-work birthday dinner - but thankfully attempt three turned out fine. Supplies include: this paper pad, my go-to birthday stamp set and enamel dots. When my mutterings diminished and Boyf felt free to talk to me again, he asked where I had stashed the felt. He'd decided to make a card for the other birthday girl. Can't wait for the other bulbs to bloom. I've counted over 25 bulbs shooting up around the yard.